These are the results of the latest poll conducted by the Palestinian Center for Policy and Survey Research (PSR) in the West Bank and the Gaza Strip between 22 and 24 September 2016. The period before the poll witnessed the suspension of the process of local elections as a result of a decision by the Palestinian high court. It also witnessed an increase in cases of security breakdown especially in the Nablus area, major disruptions in access to running water throughout the West Bank, continued debate on the French Initiative, an acceptance by President Abbas of a Russian invitation for a meeting in Moscow with Israeli Prime Minister Netanyahu, and others. This press release addresses many of these issues and covers attitudes regarding local elections, conditions in the West Bank and the Gaza Strip, the increase in cases of security breakdown, water shortages, reconciliation, the peace process, the French Initiative, and the Russian invitation. Total size of the sample is 1200 adults interviewed face to face in 120 randomly selected locations. Margin of error is 3%. In addition to the usual trend issues, this poll focused on three matters: local elections, the water crisis that affected West Bank residents during the summer, and the recent rise in the number of incidents of internal security breakdown. Findings show that a majority of the public is dissatisfied with the decision of the high court to suspend the local election process and views it as a political decision aiming at cancelling the elections. If local elections are held today, the public is certain that Hamas will win in the Gaza Strip but it expects Fatah to win in the West Bank. Findings also indicate that a clear majority of West Bankers have suffered from water shortages during this past summer and that most of those who experienced water shortages had to buy water in tanks. While a large percentage of the public blames Israel for the water crisis, because it reduced water allocation to the Palestinian territories, a larger percentage places the blame on the Palestinian side. With regard to recent internal security breakdowns, the public sees three drivers: weak and inconsistent performance by the PA security services, weak courts and justice system, and a surge in family and societal conflicts. There is no doubt that a great part of the motivation for the public rejection of the high court decision regarding local elections, despite the fact that these elections will take place under conditions of national and territorial disunity, is related to a democratic impulse. This attitude appears at odd with past findings in which national unity impulses trumped democratic ones. It is clear from the findings that the public believes that a successful holding of local elections throughout the West Bank and the Gaza Strip will significantly improve the chances for holding presidential and parliamentary elections that have not been held for more than a decade. On the other hand, it is clear that the national unity impulse is not totally absent. About one third of the public is unhappy about the fact that local elections, if held, will take place under conditions of disunity. Indeed, a slight majority rejects the idea of holding parliamentary and presidential elections under the same conditions. It is worth noting that there are no significant differences between attitudes of the residents of the West Bank compared to those in the Gaza Strip regarding all the issues mentioned above, indicating perhaps that the motivation for both sides is not related to geography or region. Compared to our findings three months ago, current findings indicate a strengthening of three developments found in the second quarter of 2016: (1) support for armed action continues to decline; (2) support for the French Initiative increases slightly; and (3) Fatah’s popularity improves somewhat compared to that of Hamas and demand for Abbas’ resignation decreases. Nonetheless, the current level of support for an armed intifada remains high and a majority opposes the Russian invitation for a meeting between Abbas and Netanyahu in Moscow. Moreover, the public remains highly pessimistic about the French Initiative’s chances of success. Finally, Hamas’ candidate for the presidency, Ismail Haniyeh remains more popular than Abbas. 61% are dissatisfied with the high court’s decision to suspend the local elections process and 60% view it as politically motivated. If local elections are held, 50% say that the most important consideration for their vote is the ability of the electoral lists to deliver services; 31% say it is the ability to defend national rights. In local elections, 35% say that Fatah lists are the most able to deliver services and 17% say Hamas lists are the most able to do so. 28% say that Fatah local election lists, and 26% say Hamas local election lists, are the most able to defend national rights. 48% expect the cancelation of the local elections and 40% expect local elections to take place soon. A majority of 61% is displeased with the decision of the Supreme Court of Justice to temporarily suspend the local election process and 29% are pleased. Findings show that 60% believe that the decision was politically motivated and aimed at scuttling the election process while 31% believe that the decision was a legal one and aimed at correcting the election process. Dissatisfaction with the court’s decision is higher in the Gaza Strip (63%) than in the West Bank (60%); among t hose whose age is 50 and above (68%) compared to those whose age is between 18 and 22 years (52%); among Hamas supporters (77%) compared to supporters of Fatah and third parties (51% and 61% respectively); among residents of cities (64%) compared to residents of villages and refugee camps (48% and 53% respectively); among men (64%) compared to women (57%); among the religious (64%) compared to the non-religious and the somewhat religious (50% and 60% respectively). 54% say that not holding local elections in the occupied East Jerusalem is not a good reason to stop local elections in the rest of the Palestinian territories. Similarly, 57% say that the fact that courts in the Gaza Strip, under Hamas control, ruled on election cases submitted to them in the Strip is not a good reason to stop local elections. 35% believe that Fatah and Hamas together wish to cancel local elections while 23% believe that it is Fatah that wishes to cancel these elections; only 14% believe that it is Hamas who wishes to cancel the elections. 41% say they have not registered to participate in local elections while 50% say they have registered. Among those who have registered, 81% say they intend to participate in the elections if and when they are held. 50% of those who intend to participate in the local elections say that the most important voting consideration is the ability of the electoral list to deliver services such as water, electricity, roads and other matters of daily life; 31% say that the most important consideration is the ability of the list to defend the rights of the Palestinian people and to contribute to the ending of the Israeli occupation; 9% say it is to serve the interests of the family; and 9% say the most important consideration is the support of the political party they are affiliated with. When evaluating the ability of the various electoral lists to meet the various considerations, 35% believe that the list supported by Fatah is the most able to deliver services while 17% believe that the list supported by Hamas is the most able to deliver services; 15% say it is the list of independents and professionals while only 3% say it is the list supported by the Left. With regard to the ability to defend national rights and contribute to ending occupation, 28% believe that the list supported by Fatah is the most able to do that while 26% believe that the list supported by Hamas is the most able to do that; 11% say it is the list of independents and professionals while only 2% say it is the list supported by the Left. The largest percentage (48%) believes that the local elections will be called off but 40% believe they will take place soon. If local elections do take place soon, the largest percentage (39%) believes they will assist in the process of reconciliation while 32% believe they will weaken the process of reconciliation and 25% think they will have no impact. If local elections are held soon, a majority of 56% expects Hamas lists or lists supported by Hamas, and 21% expect Fatah lists or lists supported by Fatah, to win in the Gaza Strip. With regard to election outcome in the West Bank, 44% expect Fatah lists or lists supported by Fatah, and 26% expect Hamas lists or lists supported by Hamas, to win. Expectations of election outcome differ in the Gaza Strip compared to the West Bank. For example, while 66% of West Bankers expect Hamas lists would win in the Gaza Strip, the percentage among Gazans drops to 37%. Moreover, while 36% of Gazans believe Fatah lists are likely to win in the local election in the Gaza Strip, the percentage drops to 14% among West Bankers. These differences diminish somewhat when predicting the outcome of the local elections in the West Bank: 34% of Gazans compared to 22% of West Bankers expect Hamas would win and 34% of Gazans and 49% of West Bankers expect Fatah would win. More than three quarters of the public (76%) support, and 18% oppose, the participation of West Bank refugee camps in the local elections. Demand for Abbas’ resignation decreases from 65% t0 61%. In presidential elections between President Abbas and Ismail Haniyeh, the latter receives 48% and the former 45%. In presidential elections between Marwan Barghouti and Ismail Haniyeh, the latter receives 36% and the former 58%. In parliamentary elections, Hamas receives 32% and Fatah 37%. A majority of 51% rejects holding presidential and parliamentary elections under conditions of disunity identical to those under which local elections might, with public approval, be held. 42% believe that Fatah and president Abbas are the ones who impede the holding of presidential and parliamentary elections; only 22% put the blame on Hamas. 61% of the public want president Abbas to resign while 33% want him to remain in office. Three months ago, 65% said they want Abbas to resign. Demand for Abbas’ resignation stands at 58% in the West Bank and 65% in the Gaza Strip. If president Abbas does not nominate himself in a new election, 37% prefer to see Marwan Barghouti replacing him, while 19% prefer Ismail Haniyeh; Khalid Mishal and Mohammad Dahlan receive 5% each, Rami al Hamdallah receive and Mustapha Barghouti receive 4% each; Salam Fayyad receives 3%, and Saeb Erekat 1%. Level of satisfaction with the performance of president Abbas stands at 37% today compared to 34% three months ago. Level of satisfaction with Abbas stands at 38% in the West Bank and 36% in the Gaza Strip. If new presidential elections were held today and only two were nominated, Ismail Haniyeh and Mahmoud Abbas, the former would receive 48% (compared to 48% three months ago) and the latter 45% (compared to 43% three months ago). In the Gaza Strip, Abbas receives 47% of the vote (compared to 41% three months ago) and Haniyeh receive 50% (compared to 49% three months ago). In the West Bank Abbas receives 43% (compared to 41% three months ago) and Haniyeh 46% (compared to 47% three months ago). If presidential elections were between three: Mahmud Abbas, Marwan Barghouti and Ismail Haniyeh, Abbas would receive 21%, Barghouti 41% and Haniyeh 33%. And if presidential elections were between two: Marwan Barghouti and Ismail Haniyeh, Barghouti receives 58% and Haniyeh 36%. If new legislative elections were held today with the participation of all factions, 71% say they would participate in such elections. Of those who would participate, 32% say they would vote for Hamas and 37% say they would vote for Fatah, 7% would vote for all other third parties combined, and 24% are undecided. Three months ago, vote for Hamas stood at 31% and Fatah at 34%. Vote for Hamas in the Gaza Strip stands today at 37% (compared to 33% three months ago) and for Fatah at 39% (compared to 35% three months ago). In the West Bank, vote for Hamas stands at 29% (compared to 29% three months ago) and Fatah at 36% (compared to 34% three months ago). Despite supporting the holding of local elections under current conditions in which Hamas has effective control over the Gaza Strip and in which the PA under Abbas and the Reconciliation Government controls the West Bank, a slim majority of 51% opposes, and 42% support, holding presidential and parliamentary elections under identical conditions. 59% believe, and 32% do not believe, that a successful holding of local elections would hasten the holding of parliamentary and presidential election. A plurality of 42% believes that Fatah and president Abbas are the ones who are impeding the holding of parliamentary and presidential elections in the Palestinian territories while only 22% believe that Hamas is the real impediment. Perception of safety and security stands at 48% in the Gaza Strip and 42% in the West Bank. 46% of Gazans and 29% of West Bankers want to immigrate to other countries. 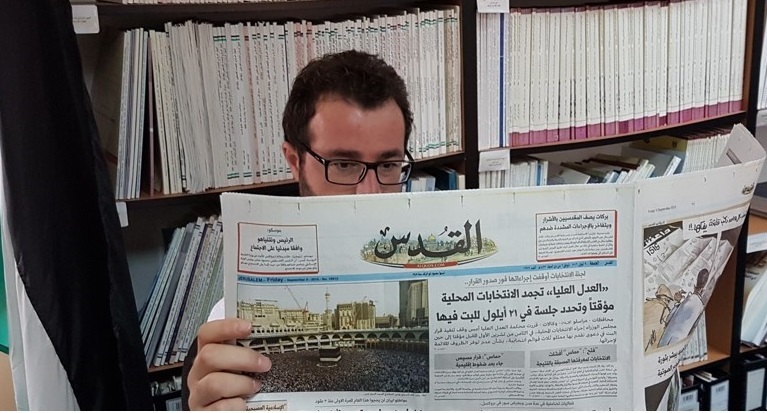 The belief that there is corruption in the PA institutions stands at 79%; only 16% believe there is press freedom in the West Bank and 14% believe there is press freedom in the Gaza Strip. 47% believe that the PA is a burden on the Palestinian people and 46% believe it is an asset. 59% oppose and 26% support the return of Mohammad Dahlan to Fatah. 57% believe that the recent death of a detainee in Nablus due to beating by the PA security services was deliberate. Positive evaluation of conditions in the Gaza Strip stands at 15% and positive evaluation of conditions in the West Bank stands at 26%. Perception of safety and security in the Gaza Strip stands at 48%. In the West Bank perception of safety and security stands at 42%. Three months ago, perception of safety and security in the Gaza Strip stood at 44% and in the West Bank at 44%. Findings show that the percentage of Gazans who say they seek to immigrate to other countries stands at 46%; in the West Bank, the percentage stands at 29%. Three months ago 45% of Gazans and 22% of West Bankers said they seek to emigrate. We asked the public about its viewership habits in the last two months. Findings indicate that Maan TV viewership is the highest, standing at 19%, followed by al Jazeera TV (at 16%), Hamas’ al Aqsa TV (at 15%), Palestine TV at 14%, Filasteen al Youm (Palestine Today) at 11%, Al Arabiya at 6%, al Quds TV at 4%, and al Mayadeen at 2%. Perception of corruption in PA institutions stands at 79%. 16% say there is press freedom in the West Bank and 14% say the same about the status of the press in the Gaza Strip. Only 33% of the Palestinian public say people in the West Bank can criticize the PA authority without fear. 47% view the Palestinian Authority as a burden on the Palestinians while 46% view it as an asset. In light of Arab pressure on Abbas to unify Fatah ranks, 59% oppose and 26% support the return of Mohammad Dahlan to Fatah. Support for Dahlan’s return to Fatah is higher in the Gaza Strip (41%) compared to the West Bank (19%); among Fatah supporters (46%) compared to supporters of Hamas and third parties (17% and 22% respectively); in refugee camps (37%) compared to cities and villages (25% each); among men (29%) compared to women (23%); among the somewhat religious (30%) compared to the religious (21%); among refugees (30%) compared to non-refugees (24%); and among those working in the public sector (36%) compared to those working in the private sector (28%). 47% believe that the goal of the security campaigns occasionally carried out by the Palestinian security services is to enforce law and order; but 41% believe that these campaigns aim at cracking down on those who are opposed to the PA. A majority of 57% believes that the recent death of a detainee from Nablus after being beaten by members of the PA security services was intentional while only 25% believe it was unintended mistake. The public is divided on the main factors behind the recent incidents of security breakdown in the West Bank: 36% of the public believe that the main reason is the weakness of the PA security establishment and its failure to enforce the law on a continuous basis; 30% believe the reason is the rise in family and societal conflicts; and 29% believe that a weak court and justice system is the main reason for it. 33% of the public support the new high school (Tawjihi) system and 25% do not support it; 17% neither support nor oppose it and 22% have not heard about it. 91% of the public would like to see the Allenby Bridge Crossing open on 24-hour basis; however, only 46% expect that to happen. An overwhelming majority of 79% is worried, and 19% are not worried, that recent reductions in the services provided by UNRWA to Palestinian refugees might lead to a gradual abandonment of its responsibilities to those refugees. 58% of West Bankers indicate that their areas of residence have been affected by water shortages during this past summer and 64% of those affected indicate that they had to buy water by tanks. 45% blame Israel for the water shortages because it reduced the quantities of water made available to Palestinians; but 49% place the blame on the Palestinian side. 67% believe that there is no justice in water allocation between the various Palestinian localities and 48% believe there is no justice in water allocation to various neighborhoods in the area where they live. 55% believe that the PA should deal with the water crisis by digging more wells even if this measure leads to confrontations with the Israeli army. 46% of the public (58% in the West Bank and 22% in the Gaza Strip) indicate that the areas where they live have suffered from water shortages during this past summer as a result of a decrease in the quantity of water allocated to them; 50% indicate that their areas did not suffer shortages. Shortages have been reported highest among residents of villages and towns (65%) compared to cities and refugee camps (43% and 45% respectively). Shortages are very high in the governorates of Jenin (79%), Hebron (76%), and Nablus and Salfit (75% each) followed by Ramallah (64%), and Toubas and Bethlehem (59% each). Shortages seem lower in Tulkarm (12%), Qalqilia (18%), Jerusalem (33%), and Jericho (43%). A majority of 58% of those whose areas suffered from water shortages indicates that water did reach their homes at least once every week; 26% once every month; and 10% said water reached them only rarely. Moreover, 64% of those who suffered water shortages indicate that they were forced to buy water by the tank to compensate for the decrease in water availability; 34% indicate that they were not forced to buy water by the tank. While 45% of the public blame Israel for reducing the water quantities allocated to Palestinian territories, 49% place the blame on the Palestinian side (29% say that the water crisis is caused by PA mismanagement; 12% say it is due to crumbling infrastructure; and 8% say that water theft by some Palestinians prevent water from reaching its intended consumers). Two thirds (67%) of the public believe that there is no justice or fairness in the allocation of water to the various areas of the Palestinian territories; 19% believe water allocation is fair. Moreover, 48% of the public believe that there is no justice or fairness in the allocation of water to various neighborhoods in their area of residence while 46% think allocation is fair. Given Israeli control over Palestinian water resources, a majority of 55% believes that the most effective means of addressing the recurring water crises is to dig more wells even if such a measure leads to confrontations with the Israeli army; 35% believe that water desalination is the most effective solution; and 4% believe that raising water rates on the consumers might reduce demand and help resolve the problem. Optimism about reconciliation decreases from 36% to 31%. Only 28% are satisfied with the performance of the reconciliation government. 17% say that Hamas is responsible for the poor performance of the reconciliation government but 44% place the blame on the PA, President Abbas, and the prime minister. Optimism about the success of reconciliation and the end of the split stands today at 31% and pessimism at 65%. Three months ago optimism stood at 36% and pessimism at 60%. 28% say they are satisfied and 61% say they are dissatisfied with the performance of the reconciliation government. In the Gaza Strip, dissatisfaction stands at 70% and in the West Bank at 57%. Belief that Hamas was responsible for hindering the functioning of the reconciliation government does not exceed 17% (8% in the West Bank and 35% in the Gaza Strip) while 30% believe that the PA and president Abbas were to blame for that and 14% blame the prime minister of the reconciliation government. 49% support and 50% oppose the two-state solution. 34% believe that negotiation is the most effective means of establishing a Palestinian state and 34% think armed action is the most effective means. 31% support a one-state solution. 53% support the French Initiative but only 28% expect it to succeed. 55% reject the Russian invitation for a meeting between Abbas and Netanyahu in Moscow. 54% believe that Israel’s long term aspiration is to annex all lands occupied in 1967 and expel the Palestinian citizens. 75% support joining more international organization, 64% support popular non-violent resistance, and 48% support a return to an armed intifada. On the two-state solution, the public is divided into almost equal halves: 49% support and 50% oppose it. Three months ago, 51% supported it. Palestinians are divided into three groups on the most effective means of building a Palestinian state next to the state of Israel: 34% believe that negotiation is the most effective; 34% think armed action is the most effective; and 27% think non-violent popular resistance is the most effective. Three months ago, 43% said armed action is the most effective means. A majority of 56% believes that the two-state solution is no longer viable due to settlement expansion while 40% believe that it is still viable. A minority of 31% supports a one-state solution in which Jews and Arabs enjoy equal rights; 67% oppose the one-state solution. Three months ago, support for the one-state solution stood at 34%. 73% believe that the chances for creating an independent Palestinian state alongside the state of Israel during the next five years are slim or non-existent while 25% believe the chances are medium or high. 54% support and 36% oppose abandoning the Oslo agreement. Three months ago, 56% of the public supported the abandonment of the Oslo agreement and 36% opposed it. Support for the abandonment of the Oslo agreement stands at 53% in the West Bank and 55% in the Gaza Strip. But 63% of the public believe that despite his statement to the contrary, president Abbas is not serious about abandoning Palestinian Oslo obligations and only 27% think he is serious. Three months ago, 67% expressed the view that the president is not serious. We asked the public about its support for the French Initiative. The initiative we presented to respondents as one that “calls for the formation of an international support group for Palestinian-Israeli negotiations, the holding of an international peace conference that would seek a settlement based on the two-state solution and the Arab Peace Initiative in accordance with a specific time frame.” 53% of the respondents supported and 38% opposed the initiative. Support reached 51% in the West Bank compared to 57% in the Gaza Strip. We also asked respondents to indicate their expectations regarding the success or failure of the French Initiative in assisting the goal of reaching Palestinian-Israeli peace. 28% expected success and 59% expected failure. Here too there was a significant difference between residents of the West Bank compared to residents of the Gaza Strip: 42% of Gazans, compared to only 21% of West Bankers, expected success. A majority of 55% opposes and 36% support the acceptance of the Russian invitation to hold a meeting between President Abbas and Prime Minister Netanyahu. The percentage of those who are worried that they would be hurt by Israel or that their land would be confiscated or homes demolished stands at 80%; 20% are not worried. Furthermore, a majority of 54% believes that Israel’s long term aspiration is to annex the lands occupied in 1967 and expel their population and 30% believe that Israel wants to annex the West Bank while denying the Palestinians their rights. 14% believe that Israel’s long term aspiration is to insure its security and withdraw from all or most of the territories occupied in 1967. When asked about the long term aspiration of the PA and the PLO, 64% said that it is to recover all or parts of the land occupied in 1967. By contrast, 12% said it is to conquer the state of Israel and 11% said it is to conquer the state of Israel and kill most of the Jews. An overwhelming majority believes that al Haram al Sharif is in grave danger: 52% believe that Israel intends to destroy al-Aqsa Mosque and the Dome of the Rock and replace them with a Jewish temple; 17% believe that it intends to divide the plateau on which the two mosques sit so that Jews would have a synagogue alongside the Muslim holy places. Only 11% believe that Israel is interested in maintaining the status quo without change. 44% support and 50% oppose the Saudi or Arab Peace Initiative. 39% support and 60% oppose the proposal that calls for mutual recognition of Israel as the homeland for the Jewish people and Palestine as the homeland for the Palestinian people in the aftermath of peace and after the establishment of a Palestinian state. In the absence of peace negotiations, 75% support joining more international organizations, 64% support non-violent popular resistance, 48% support a return to an armed intifada, and 44% support the dissolution of the Palestinian Authority. Three months ago, support for a return to an armed intifada stood at 54%. More than three quarters believe that Palestine is no longer the Arab’s primary cause and 60% believe that there is an Arab Sunni alliance with Israel against Iran. 39% believe that the Turkish-Israeli reconciliation agreement will contribute to reducing the siege and blockade on the Gaza Strip and 28% believe it will make it worse. 89% view ISIS as a radical group that does not represent true Islam and 83% support the war against it. 70% see no difference between the two US presidential candidates, Clinton and Trump. 76% say the Arab World is too preoccupied with its own concerns, internal conflicts, and the conflict with Iran and that Palestine is no longer the Arab’s principal or primary issue or cause. Only 24% think Palestine remains the Arab’s principle cause. 60% believe that there is an Arab Sunni alliance with Israel against Iran despite the continued Israeli occupation of Arab land while 27% believe that the Arabs would not ally themselves with Israel until it ends its occupation and allows the creation of a Palestinian state. A majority of 64% believes that the recent visit of Saudi academics to the Palestinian territories and Jerusalem and their meeting with Israeli officials is a signal of accord between the Saudis and the Israelis; 26% think the visit does not signal that. 39% of the public believe that the recent Turkish-Israeli reconciliation will have a positive impact by reducing the siege and blockade on the Gaza Strip; by contrast, 28% think it will have the opposite effect by intensifying the siege and blockade, and 29% think it will have no impact. An overwhelming majority of 89% believes that ISIS is a radical group that does not represent true Islam and 5% believe it does represent true Islam. 6% are not sure or do not know. In the Gaza Strip, 9% (compared to 3% in the West Bank) say ISIS represents true Islam. 83% support and 14% oppose the war waged by Arab and Western countries against ISIS. We asked the public about the US elections and which presidential candidate, Hilary Clinton or Donald Trump, is best for the Palestinians. A large majority (70%) believes that there is no difference between the two candidates, while 16% believe Clinton is better and 5% believe Trump is better. 46% believe that the most vital national goal should be the establishment of a Palestinian state and the ending of occupation and 30% believe it should be the gaining of the refugees’ right of return. The most serious problem confronting Palestinian society today is occupation, followed by corruption and poverty and unemployment. 46% believe that the first most vital Palestinian goal should be to end Israeli occupation in the areas occupied in 1967 and build a Palestinian state in the West Bank and the Gaza Strip with East Jerusalem as its capital. By contrast, 30% believe the first most vital goal should be to obtain the right of return of refugees to their 1948 towns and villages, 13% believe that it should be to build a pious or moral individual and a religious society, one that applies all Islamic teachings, and 11% believe that the first and most vital goal should be to establish a democratic political system that respects freedoms and rights of Palestinians. The most serious problem confronting Palestinian society today is the continuation of occupation and settlement activities in the eyes of 29% of the pubic; 28% say it is the spread of corruption in public institutions; 22% say it is poverty and unemployment, and 15% say it is the siege of the Gaza Strip and the closure of its crossings.